Tonight we face Aston Villa in a game where we must return to winning ways. Three points is a must against a team who were woeful against Liverpool on Sunday. I'm sure this team will take the positives from the loss to Manchester City on Sunday. We certainly weren't out played and should have taken something from the game. At 7.45pm we have a chance to respond. "We are a team who wants to respond quickly now and keep our spirit and determination. "Then we have a bright future, but it’s important that if we keep that spirit and determination we can go from strength to strength." The team news isn't good. 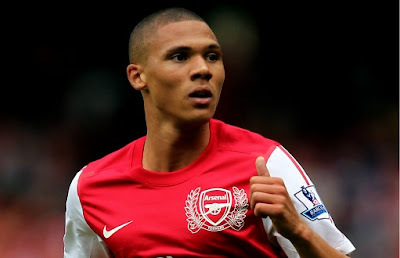 As I suggested yesterday, Kieran Gibbs is out of tonight's match. Wenger confirmed he'd suffered a set back. How long the left back will be out for this time remains to be seen as he will see a specialist. But it leaves us short of options in defence. The immediate concern of the manager is tonight's game. I don't think he's got any other option other to hand Ignasi Miquel his first Premier League start. The Spaniard has come into the team and performed well and personally I would rather have the 19-year-old on the left flank rather than Thomas Vermaelen, because the Belgium international provides us with a much more solid centre. At right back we also have a problem, with Johan Djourou likely to miss the next three weeks because of a groin injury. It's exactly what we didn't need. Yet again we're likely to have to field a central defender there - most likely Laurent Koscielny - the white Cafu -because he's a lot less scary and more dependable than the other possible options which include Sebastien Squillaci, Nicholas Yennaris or Francis Coquelin. It's not a position the manager thought he'd be in and it's a freak of nature we're left with no recognised full backs available to play. When he sold Gael Clichy, Armand Traore and Emmanuel Eboue in the summer, would Wenger have really thought that he'd have his four defenders out at the same time, all for a period of time. I don't think any blame can be left with the manager over this problem, although I'm sure some will blame him. What is surprising is that we've not got any young players coming through the ranks that can play at full back. We've always seemed to previously had a glut of talented full-backs who could come in when needed. It seems the production line for producing Wenger style left backs is running dry. There is a lot of talk about Wayne Bridge signing as cover during the January transfer window. I really hope we can do better than a player who doesn't appear to want to play football - despite being paid £90k a week by Manchester City. But at the moment as Arsene says, we don't have very many options because all the best left backs aren't going to be available on loan. "It is not a shop, you just take a good opportunity that is on the market when you can. Overall that's what we are doing at the moment. We are starting to look at players if Gibbs is not back." We don't appear to be able to depend on Gibbs, so even if he does return sooner rather than later, a signing in that position would still make sense. The other area where the manager has to make a decision about his team tonight is in midfield where we are without Alex Song because he accumulated his fifth yellow card of the season against Manchester City on Sunday and now is forced to sit out our trip to Birmingham to serve a one match suspension. I guess the manager will bring in Emmanuel Frimpong - who is not Messi (like we didn't already know that!) - because he seems to be above Francis Coquelin in the pecking order having been on the bench for the last two games. And the rest of the team picks itself. Subs: Almunia, Squillaci, Coquelin, Rosicky, Benayoun, Arshavin, Chamakh. Captain Robin van Persie has been talking about a need to be more pragmatic about the way we play football. "Nobody can play beautiful football all the time. When that happens I tell our lads 'If it's not happening for you, just try to kill off the game so we can move on'. "I am still a lover of the beautiful game and always will be but I have become more realistic. "It is too romantic to think that you can win matches by playing beautiful football alone. "Barcelona are the exception — and I have to admit they and Arsenal are the only teams that I often watch on TV." I think that we've seen with this Wenger side that they are more capable of grinding out results than his other teams. I would put it down to the extra maturity in the dressing room and an attitude that we want to win, no matter how we score. Players like Mikel Arteta and Per Mertesacker I would suggest have brought that to the team and Yossi Benayoun knows he has to keep it simple when he comes on and play keep ball at the end of matches rather than stretching ourselves by trying to score another goal. Let's hope this added maturity can gain us three points tonight.